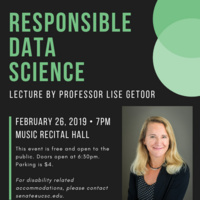 The 53rd Annual Faculty Research Lecture will be given by Professor Lise Getoor on Tuesday, February 26, 2019 at the Music Recital Hall in the Performing Arts Complex. Data science is an emerging discipline that offers both promise and peril. Responsible data science refers to efforts that address both the technical and societal issues in emerging data-driven technologies. Prof. Getoor is a computer scientist who is well known for her theoretical work that integrates logic and probability to reason collectively and holistically about context in structured domains. In this lecture, she will describe some of the opportunities and challenges in developing the foundations for responsible data science. How can machine learning and AI systems reason effectively about complex dependencies and uncertainty? Furthermore, how do we understand the ethical and justice issues involved in data-driven decision-making? There is a pressing need to integrate algorithmic and statistical principles, social science theories, and basic humanist concepts so that we can think critically and constructively about the socio-technical systems we are building. In this talk, she will lay the groundwork for this important agenda.